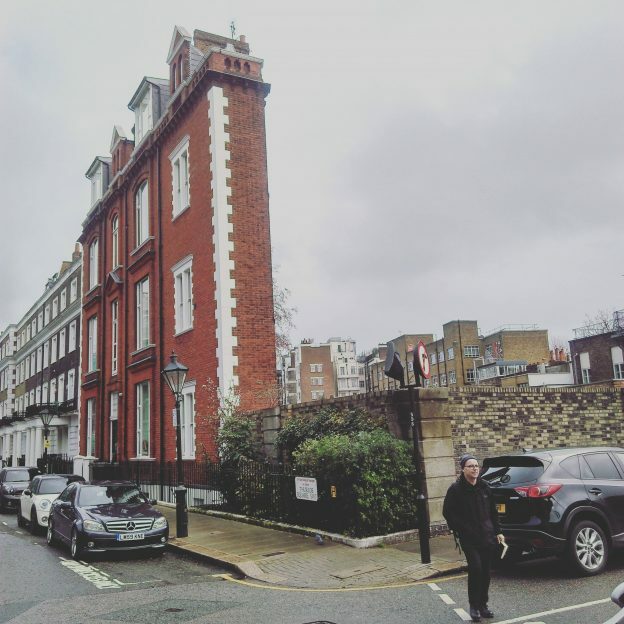 As we try to unravel fact from fiction, whether it is the novels she wrote or her autobiography, Dame Muriel Spark led us on an obscure trail in Kensington. Once well established as a literary author, in the 1980s she wrote two novels, on reflection set in Kensington in the 1950s: “A Far Cry from Kensington” and “Loitering with Intent” – both of which drew heavily on her own experiences in trying to have her first literary success and in working for publishers who were less than authentic themselves. Joined by a group of enthusiasts, our latest “Between the Lines” adventure, began at the Pelham Street entrance of South Kensington tube station. We wandered through ‘pucker Kensington’ little changed from the times when Muriel lived not far away, she either in digs with inconsistent landladies or cohabiting with friends. The 1950s were a period of transition, not least for the country as a whole as it looked back on the war and gave up rationing, but also for Muriel Spark, as she converted from lapsed Jew, via Anglo-catholic, to a Roman Catholic in just a handful of years. On our walk, we visited key centres of faith that offered guidance and support to Muriel Spark, as well as those that appeared as key locations in her ‘Kensington novels’. 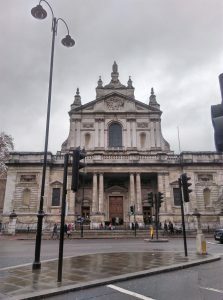 Participant, Chris Amies has generously shared his photographs from the walk, and these include, a shot of Brompton Oratory where Wanda, a Polish seamstress who is blackmailed in “Loitering with Intent” regularly attends Sunday services. The Oratory stands in front of the Roman Catholic parish church where Muriel herself worshipped. 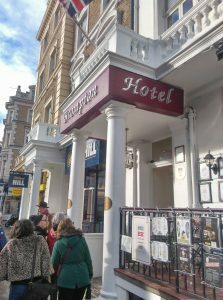 We went in search of various addresses at which Muriel Spark lived and worked, as well as the Brompton Hotel at which she entertained ‘acquaintances for drinks’ so that they should never see the squalor in which she had to live. One such address is now highly fashionable, Queensgate Terrace, where a one bedroomed apartment (much like that that Muriel rented for a less than 10 shillings a week) is on sale for £1.495 million! Our route took us as far as the churchyard of St Mary Abbots, just off Kensington High Street, where Muriel lived on the benefit of the parish priest, and where both the opening and closing of “Loitering with Intent” takes place. The subsequent biography by Martin Stannard reveals that at this very same spot, Muriel Spark made out with her one time lover and fellow literary critic David Sandford, who is mocked mercilessly as a ‘pisseur de copie‘ in “A Far Cry to Kensington”. 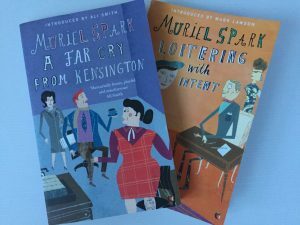 Last Sunday’s Muriel Spark and Kensington drew on the excellent resources of the National Library of Scotland and their website celebrating the anniversary of her birth: murielspark100 Birlinn Pulbishers generously gave us copies of their hardback anniversary editions of two of her novels. Museum Co-creator, Nigel Bristow and participant Dave Hearle, read extracts from the novels. We were delighted to learn that one of our participants had actually met and chatted to Dame Muriel Spark – a lovely surprising discovery. So where next for “Between the Lines” our nascent walking reading club? We think that cold January weather is just the setting for an investigation into the whereabouts of J G Ballard‘s “Concrete Island” – somewhere beneath the Westway! We will be announcing a mid- January date shortly and we hope you will join us. We would love to hear your suggestions for authors with books published since 1945 that draw heavily on particular neighbourhoods. Participants have so far suggested, Tracey Chevalier’s ‘Fallen Angels‘ (set in Highgate Cemetery), Robert Rankin’s, ‘Brentford Triangle‘, and Michael Moorcock’s ‘Mother London‘. 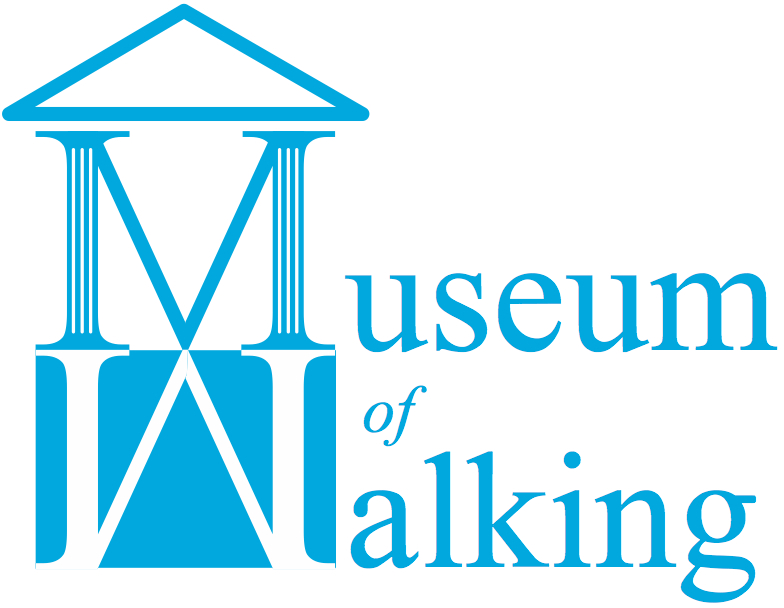 It has been quite a week for the Museum of Walking as we have not only been to Kensington, but Walthamstow for another Hidden Garden Haiku, and next up is a Midweek Mulberry that includes a stroll through Green Park and St James’ Park. It is has also been a terrific week for listening to the Talking Walking archive. Martin Foessleitner wants to ensure you find out more about local neighbourhoods in Vienna, by being reassured that the path your on is the right one. He is an information designer who has been working on the city’s way finding system for pedestrians. 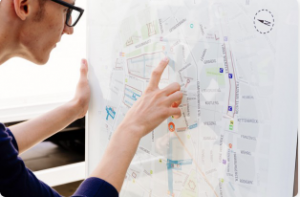 Although tempting to add more information and details to a map, he insists that clarity and consistency requires less detail, and one defining landmark. He wasn’t always a walker, having previously commuted by subway and tram, but he has subsequently learnt through experience, how much more reliable travel on foot can be. As a convert, he tells a compelling story of how we humans are hard wired to walk our local neighbourhoods. Listen to Martin as we walk through central Vienna. Julian Rickert creates theatre shows in cities arguing that “the city is an amazing set with an amazing cast of characters”. For his shows you won’t be following a narrative – that’s up to you – but you will encounter some out of the ordinary occurrences and may find yourself immersed in someone else’s plot. Working with a small group of passionate theatre makers, called ‘one step at at time like this‘ for more than 14 years, accepting failure as wells successes, means that they have tremendous trust in each other’s abilities to create immersive experiential performances that he describes as ‘site-responsive theatre’. Multi-award winning, international successful, they must be doing something right? 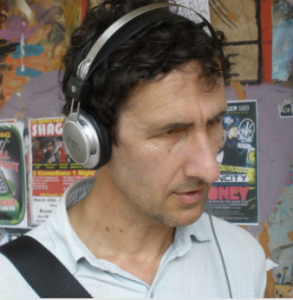 Listen to Julian as he describes how they make work and the out of the ordinary happen. Lise Pape has achieved more in product design by her early thirties, than many ever achieve in their lifetime. 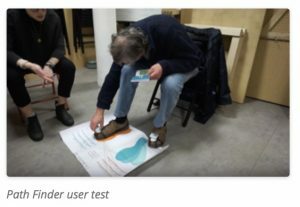 Seeing her father struggle and stumble with Parkinson’s she researched what might help him be more mobile, however, falling short of finding any practical solution, she went out and designed a simple and effective device. Walk with Path It uses the downward pressure of the step to generate a laser light, that produces a visual cue that tricks the brain of the Parkinson’s suffer to believe they have to step over something. Lise found out that Parkinson’s sufferers find it easier to step up stairs than to walk along the level, and that they frequently find their feet frozen to the ground, unable for their brain to calculate what to do next. 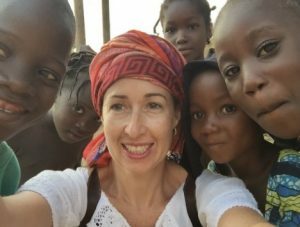 So should you think that one shoe accessory that could help thousands of people to have more a mobile life was a remarkable achievement, what if you were told that Lise has invented a second one? She has created an insole that sends electrical pulses equivalent to nerve sensations to help those with diabetes also become more mobile. Diabetes causes the loss of nerve endings in the sole of the foot – sufferer become unable to feel the surface on which they tread. Listen to Lise’s remarkable story of how she came to invent these incredible shoe accessories. to wear down a heel so that the boot or shoe is mis-shapen, as in “The heels on his boots were squoiled down.” from the Dictionary of Newfoundland English (University of Toronto Press, 1982).